Tech startups are some of our favorite clients, their energy and excitement are like music to us. Max Sound (MAXD) was just such a client. They developed a revolutionary audio technology that would significantly improve the quality of audio in phones, vehicles, movies and more without increasing the size of the digital files. However, they were having a hard time getting anyone to listen to their story. They needed the volume turned up on their branding and marketing as well as help developing the UI for their mobile apps. We heard them loud and clear. Design of corporate logo and all branded material. Designed company website, online store, social media graphics, e-mail blasts and banners ads. Created marketing campaigns that were called “powerful”, “graphic-rich” and “the best I’ve seen in 20 years” by clients. 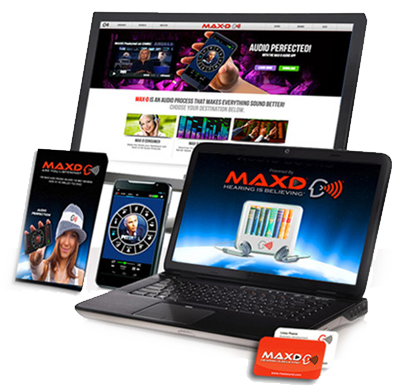 Designed the UI for Android and iOS versions of the Max Sound, Pitbull and Liquid Spins audio apps. Named as an inventor for our work on the UI. Their clean and impactful website gave them the credibility that a tech startup needs to compete, and their unique UI on their apps made an immediate impact on their visitors. Downloads took off and the feedback was great. The little audio startup is now being heard loud and clear, all across the world.